2018 has seen significant growth in terms of Artificial Intelligence, Electronic Health Records, Wearable Devices and government schemes, however, one pressing issue is emergency care that still needs to be addressed more effectively. India accounts for one-fifth of global deaths due to road accidents. A vehicular accident is reported every 2 minutes and a death every 8 minutes. Of these deaths, 40 per cent are due to bleeding out. Our paramedics and ambulatory services do not have the means or the skill-set to start treatment before reaching the hospital and victims often succumb to their injuries as they haven’t received medical care within the golden hour. In a country where fatalities due to trauma exceeds those due to cancer and heart diseases combined, we should look at driving more awareness going into 2019. There has to be a stronger commitment, both from the healthcare sector and the government, to ensure that emergency care becomes a key element in the healthcare system. The stage of Digital Healthcare is here AI, Blockchain and other technologies are progressively becoming the right hand of the healthcare industry. With rapid revolution happening in this industry and the end of 2018 fast approaching. Amit Sharma, CEO, eExpedise offers predictions on how the healthcare community will confront these innovations and demands in 2019 and beyond. More and more people will be opting for preventive care and opting for health monitoring mechanism such as health apps and wearables and monitor the risk associated with their profile. Implement on lifestyle changes and devote time and money to stay healthy. Service model from IT companies will gain prominence instead of selling of a stand-alone proprietary software or application in healthcare and insurance industries. Buyers will be more inclined to get the product customised and developed to meet the current and future healthcare market requirement rather making huge payment against the license fee of any other proprietary application owned by providing company. This way they will not only own the proprietary rights but also own the software/application having minimal dependency on provider. Increase in demand of Tele-Medicines in underdeveloped countries or rural area, Artificial Intelligence will play a vital role and will emerge as a mainstream to support the increasing demand. The healthcare industry is getting competitive with the increase in the number of high-quality providers and completion, however, data security remains the main focus. Also, an increase in the complexity of information, data and generation of huge data will require bigger space thus cloud will emerge as a core platform for all the healthcare players including the insurance companies. With the increase in usage of wearable devices and health applications will result in increase in data collections which will help in understanding the future need and design appropriate strategies and product. Dynamics in health insurance industries are changing and new insurance plans being launched with wellness services. Insurance companies and corporates will start rewarding its members for their wellness and fitness initiatives. Insurance companies can offer subsidised premium or any other monitory benefits to its member and corporates may include fitness as one of the performance scoring criteria. Adaptations of technologies in both clinical outcome and service delivery process. Artificial intelligence, machine learning, and big data will play a major role in coming years in simplifying the entire service delivery ecosystem and eliminating some of the manual process. With strict government guidelines and accreditation requirement, healthcare players will be focussing having a robust system to ensure security and maintain the confidentiality of the patient and members. More and more providers including hospitals and insurance companies will move to digitisation eliminating the paperwork. In the year 2019, it is expected that the around 30 per cent of the process will be digitised and by 2025 complete healthcare system will be digitised. The year will witness the increase in demand of Ayurveda and alternate medicines, more people are opting for alternate medicines and shifting from the modern clinical intervention to ancient medicines. As per the study, the AYUSH industry is estimated to be $10 billion and expected to grow to $25 billion by 2020. The year 2019 is very critical for Indian healthcare industry; All eyes will be on the newly introduced health for all scheme “Ayushman Bharat Scheme.” There has been huge talk of this scheme and was introduced this year (2018) but the real-execution and implementation will be in 2019. AI works to create a personalised environment for both patients and providers. Today, several companies use AI to streamline their administrative work for increasing efficiency and decreasing bureaucracy. Therefore, many healthcare experts anticipate that operationalising AI across healthcare work management would result in 10-15 per cent increase in productivity in the next 2 years. In addition, within the AI framework, machine learning will further strengthen human and machine interaction. This would create an impaction, but not limited to diagnostic, risk analytics and drug discovery verticals. 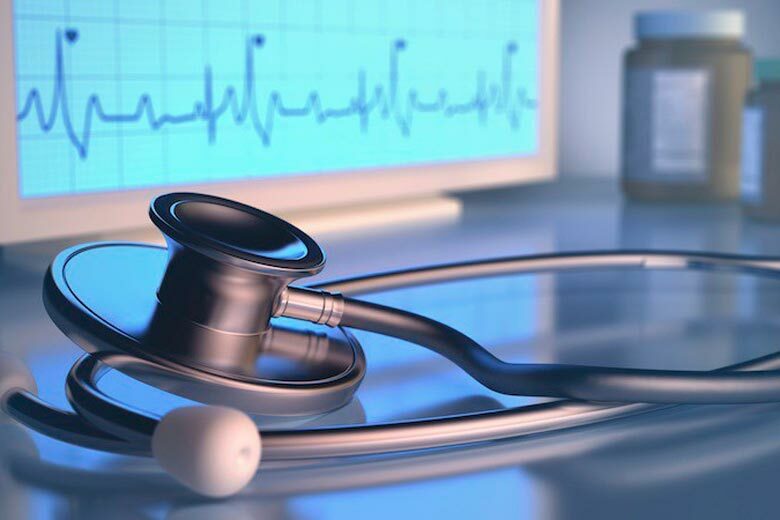 According to the estimates of a Frost and Sullivan Survey in 2018, AI for healthcare (IT application) market is expected to cross $1.7 billion by the end of 2019 and projected to achieve CAGR of 68.5 per cent by 2022. Healthcare industry is getting comfortable with data management. Thus, it is expected to see analytics solutions which will strive to investigate treatment viability, drug utilisation, and self-care programs specific to chronic conditions. Moreover, success of healthcare providers will depend upon leveraging analytics capabilities. It is expected that almost 50 per cent of healthcare companies would have resources to access, share and analyse real world data for individual conditions. In addition, several researchers have found that the adoption of big data is projected to touch $ 34.27 billion by 2022. Blockchain has gained a lot of popularity in the past several years and now blocks of the technology are going to come together into real commercial implementations. The other ways in which the technology is going to make an impact on healthcare payers and providers are by streamlining and providing transparency in process, eliminating intermediaries wherever possible, providing a guard against counterfeit drugs and reducing unnecessary healthcare costs. Insurance models play a crucial role in the healthcare payer industry. Undoubtedly, the healthcare insurance policies that are available today do not meet the personalised needs of an individual. To ensure better growth prospects of the industry, companies are focusing on providing personalised healthcare policies that are driven by data and IoT to reduce potential claims. As per the research estimates of Frost and Sullivan Survey, such innovative policies will enable insurance companies to come up with personalised premium plans by leveraging individual data. The upcoming year in healthcare sector points towards preventive healthcare due to innovative insurance models based on information from healthcare systems and data from sensors, wearables and trackers. Moving forward, single specialty hospitals and clinics are growing rapidly in India and this is going to change the facade of the under-penetrated healthcare sector. Initially, healthcare categories such as eye care, dental care were popular in the industry. With the success of the ‘Bouquet Hospital’ model now, other categories like fertility, oncology and maternity are making their way up into this sector. Emerging start ups and large players are betting big on national healthcare to generate profit in this growing boom. Another trend of ‘Budget Hospitals’ which has already become popular in the demographics of South India will headline the healthcare sector in 2019. In India, majority of the population belongs to the middle and lower economic strata. With the growing demand for good medical facilities at affordable prices, ‘Budget Hospitals’ will gain popularity in the country. In 2019, India will emerge as one of the most preferred healthcare destinations among foreigners. Especially, medical tourism from the Sub-Saharan countries is expected to grow by nearly 20 per cent. With competitive medical facilities being available in India compared to western countries, India’s medical tourism is expected to grow further in the upcoming year. While Malaysia and Singapore already have a developed healthcare infrastructure, the healthcare sector of most of the South-East Asian countries is growing at a rapid pace. In 2019, the trend is set to continue and it is expected to see further innovations in the healthcare industry.